Nothing Has Been Done Before notes that the Carolina Chocolate Drops, Drive-By Truckers, and even Bob Dylan created something new in this century by making an argument for a different understanding of our past and how it impacts our present. Western culture is obsessed with the "new". We need "new" constantly with our ever-shortening attention spans, our "fear of missing out", and our magnetization toward the latest information and content. It's what drives us to check our news feed every 15 minutes. It's what causes people to camp out in line for the latest iPhone. It's what causes a bored Kylie Jenner to tweet, "sooo does anyone else not open Snapchat anymore?" (and what causes Snap's stock to suddenly plummet in the fear that the platform is losing its "newness"). This obsession permeates throughout the arts (especially the marketing of the arts) where we look for the cutting edge, the new releases, and the "Certified Fresh" films. We long for current art, music that's happening right now and speaking to our current situations, passions, and pains. Too often, however, it seems paradoxically hard to find. The market is saturated with new releases, both popular and obscure, every day. All of it is meant to say something, but is it something new? Are there any truly new ideas? Or has it all been said before? 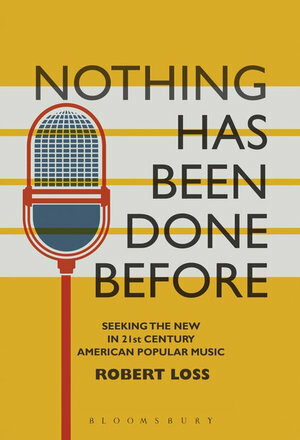 This is the debate that author Robert Loss, an assistant professor at Columbus College of Art and Design (and PopMatters contributor), steps into with his book Nothing Has Been Done Before: Seeking the New in 21st-Century American Popular Music. From the title one might infer that Loss is going to make an argument that all is new, and all music should be appreciated equally. However, by titling his book Nothing Has Been Done Before, Loss seeks not to argue that everything is new, but that everything potentially can be new. The debut single of a brand new rock band, the most recent release from a 76-year-old Bob Dylan, or even the performance of a cover band at a local bar – it all has the potential to create something that's never been created before, nor will ever be created again. To help make this argument, Loss draws on the work of esteemed philosophers (most notably Alain Badiou and his idea of "the event") to help equip music enthusiasts with categories to understand and distinguish between the truly new and the mediocre. "The opposite of the new is not the old," Loss argues, "it is sameness, or anything that limits the generation of significant possibilities." However, he says it's exactly that mediocrity that makes the new possible. Otherwise, "the new would be indistinguishable; it would not exist." Unfortunately for those of us who are worn out by the chore of wading through mediocrity to find the best of the new, Loss doesn't just give us a list of the best new music of the century and explain it. That would be too easy. Instead, Loss does the dirty work of defining the new, categorizing it in an in-depth but understandable way, and thus equips the reader to hopefully recognize the new as it's happening. Nothing Has Been Done Before is separated into three distinct sections to help make sense of the vast musical landscape of the 21st century. Part One, "The Past in the Present", discusses how revisiting the sounds of our historical past do not rule out revival-based music as new. "A replicating, derivative sound can still be new if it makes some argument about its current moment, or if it makes some distinction between the present and the past," Loss argues. He offers instances like the Carolina Chocolate Drops who use their music to bring to light forgotten pieces of history, like the incredible influence of 19th century African-American folk music, which was often misappropriated to white musicians who heard the tunes and made them popular themselves. By using the sounds of the past, groups like the Carolina Chocolate Drops, Drive-By Truckers, and even Bob Dylan created something new in this century by making an argument for a different understanding of our past and how it impacts our present. Part Two "The American Wow", is a term Loss uses to describe the gargantuan segment of American pop culture responsible for "American Idol and its imitators, fashion, multinational corporations that own 'independent' labels, awards shows, celebrity news, commercials that function as music videos, music videos that function as commercials, social media – oh yes, and the music itself." This is the American machine that determines what is relevant to your life and what defines America. It's the institution. In these chapters, Loss argues that the American Wow, for all its reliance on structure and control of sound, of message, of exposure, must be the place where real newness thrives. But how does the impossible event of something new happen in an empire-like system built on maintaining the status quo? Hubris, Loss argues, is "the weakness of Empire and those that control it… the tragic flaw." The American Wow chose artists like Kanye West, Prince, and Janelle Monáe (an arguable inclusion as she hasn't really seen mainstream success in her work) to be mouthpieces for their empire. However, sometimes artists are known to be disorderly. That's when we get My Beautiful Dark Twisted Fantasy. That's when we get the gender-bending fusion of sounds Prince employed even into the 21st century. Finally, Part Three, "Shout at the Hard of Hearing", chronicles the protest spirit of music in the 21st century as an example of how political newness can create a new event that creates not only musical change but hopefully social change. Loss makes an important distinction between documentarian protest music and truly new protest music in these chapters. Songs like the Dixie Chicks' "Travelin' Soldier" are a response to contemporary events and thus serves as "an accurate reflection of reality: a document." However, Loss believes music can have a bigger impact. "If a piece of music only reflects cultural values or certain political ideologies, then those values and ideologies are already possible… If music produces popular values through performance, however, it might become an engine of social change." Loss goes on to argue that for music to produce these values that affect social change, artists have to stop "preaching to the choir" and assume that their audience doesn't already agree with them. He finds that Bruce Springsteen was able to capture this assumption and used it to fuel his strong (though underperforming) album Wrecking Ball. On a more successful level, Kendrick Lamar creates the political new from within the American Wow on To Pimp a Butterfly by stepping into the unfinished revolution of the Civil Rights Movement and delivering a message of reformation through self-respect and self-improvement, which then turns into community-respect and community-improvement. It's so important to note that all newness, musical or otherwise, only happens through connection with history. It's only by stepping into the preconceived notions of society that we're able to disrupt them. That's why Loss argues that the truly new often happens through a revival of something old, that it happens from within "the machine", and that often it's most effective when an artist desires more than just a musical new, but a social new. Nothing Has Been Done Before combines all these elements with excellent and diverse examples of 21st century music in a thought-provoking, dense, but exciting read that will affect the way one listens for the new in music.